Best Log Splitter – Which one suits you best? Log splitters are machinery that split firewood, or hardwood or even softwood pre-cut logs. The best log splitter is powerful, yet compact. A log splitter is usually rated by the force ton it generates. The more the pressure rating, the larger the length/thickness of the log rounds it can split. Log splitters for home use have an approximate rating of 10 tons, while professional log splitter models average at 25 tons force. While the best log splitters save time, the risks involved in splitting logs is not eliminated. From a safety perspective, several hydraulic splitters have a ‘two-handed operations’, which necessitate the use of both hands for operating the machine, so that there is little chance of getting one’s hand in the way of the blade. You may think you need a large industrial capacity 25 ton (or more) log splitter, when in reality a 6 or 7-ton will do the job just as efficiently. So, first gauge the average thickness and length of the logs you will need to split, based on that you can choose the appropriately sized log splitter. Is the manufacturer popular and reliable? Are the parts replaceable, and will you have easy access to components and spare parts? This is a critical point, especially if you are looking at imported models of log splitters. Are the motor manufacturers reputed? You can have a 15 amp motor with 2 or 3 horsepower but, if the motor manufacturer is unknown, it may not be your wisest choice. Stick to the known and familiar. 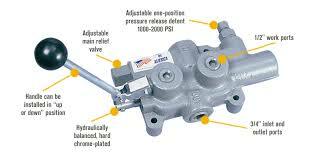 Check the motor size, pump size and the hydraulic fluid capacity and then work out if all three are compatible. If the motor size cannot accommodate the pump and fluid capacity, then the log splitter won’t last long. Before choosing a log splitter, you need to assess your requirements, so you make the best choice. Below mentioned are 3 best log splitters available in the market along with detailed description of their features, performance, and price. All three are impressive products, but only one may suit you for features and pricing. Research, see a demo and then decide the one that suits you best. 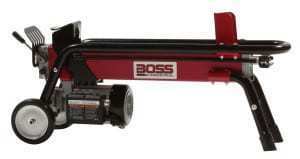 The Boss Industrial ES7T20 is the best log splitter in the market when it comes to strength and price. Its automatic ram allows you to cut through logs of all types without getting stuck. It is one of the strongest splitters in the market in its range, and though the name makes it seem industrial, you can use it for home use as well. The one-handed operation is a lot easier to maneuver, and this splitter can also cut logs horizontally. Even if the wood has knots and is difficult to split in one go, the automatic ram will withdraw the machine immediately, so you can try splitting from another angle. When you compare with other log splitters in the market, the Boss Industrial 7 ton splitter will save you a lot of time. It is very easy to use and has simple operations that are easy to understand and follow. The average home owner will be delighted with this purchase, not only because it is a user-friendly tool, but also because it is easy to clean/stow after use. The splitter can be operated horizontally as well. The one handed operation adds to the ease of use, although it’s important to ensure the unoccupied hand is nowhere close to the log or the splitter blade. 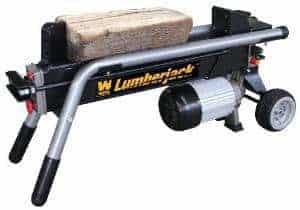 This machine can split logs at an impressive speed, and though it is not the cheapest log splitter in the market, it is a bargain if you compare it to gas splitters of the same capacity. Moreover, compared to gas log splitters, this one has lower operational costs in the long run. On the other hand, it doesn’t have a towing feature, no wheels, but being portable it’s not that difficult to carry. The marginally small issue is that the wedge of this log splitter is not replaceable. The WEN56206 6-Ton electric log splitter is the best log splitter in its price range. It has a powerful 2 horsepower 15-amp motor that can apply up to 12,000 pounds of force. This effectively means that you can evenly split a log as long as 20 inches and as wide as 10 inches. 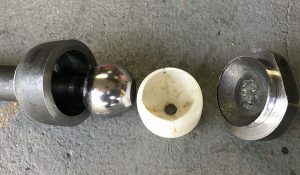 This splitter has a 4 x 4-inch push plate that’s connected to the ram, and this pushes the log into the machine wedge, which splits the log quickly, efficiently and evenly. 2 HP, 15-amp copper-wound motor. Fume free power, so this can be used both outdoors as well as indoors. Portable log splitter with 6-inch tires and 2 comfort grip handles. The WEN 6-Ton log splitter claims to split logs that are 10-inch in diameter and 20.5 inches in length. The product also claims that this record stays true for both hard and soft wood. While this is certainly true for hard wood, soft wood logs take a bit of work. Rather, when it comes to soft wood, the smoothest cut is for a maximum of 8-inch diameter. You can cut a 10-inch thick log as well, but the movement may not be as smooth as that of hard, brittle wood. The push plate and the wedge give a stable platform to place the log so that you can split evenly. This log splitter also comes with wheels and 2 rubber grips, which makes it easy to transport. The WEN 6-Ton log splitter requires two hands to operate, which takes getting used to, but is definitely a plus from a safety perspective, as it keeps your hands safe and away from the blades when the machine is on. Being electric, it doesn’t emit any fumes so you can use this splitter indoors as well as outdoors. That said, outdoors is always best, as it will save you the bother of cleaning up the fine wood splinters. The Pow’R’Kraft 65575 is the best log splitter when it comes to quiet performance. This can also be labeled the quiet log splitter. It is an easy to operate splitter requiring two handed operation. The construction of this splitter is all-steel. It has a 15-amp, 3 horsepower motor that offers dual speed. You can opt for the fast 4-ton split or the power setting of 7-ton strength split – a good combination of speed and efficiency. Can split logs measuring 12-inches in diameter and 20-inches in length. The unique feature of this log splitter is the dual speed it offers. 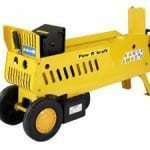 Pow’R’Kraft 7-ton log splitter has increased its desirability by incorporating the log splitting speed of their 4-ton log splitter in this model. So, you can choose the 4-ton speed and get a high speed split or choose the powerful 7-ton setting for difficult logs. 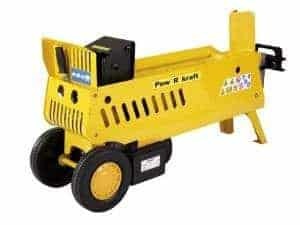 This also means that this log splitter will also give you the option to cut down electricity costs. The drawback of this splitter is that it is much heavier than other log splitters in the same range. It also requires two-handed operation, which takes some getting used to, but overall is best for log splitting safety. This splitter can run on regular house current, and there is a fault breaker that prevents overload. 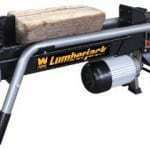 Because of its dual speed, it can easily live up to the claim of splitting logs 12-inch thick and 20-inch long. In fact, the 7-ton force also cuts through 14 inches, although the speed is not as fast as the 4-ton setting, which is ideal for logs with a smaller thickness. This log splitter, though two-handed is easy to operate. The two speeds mean that you can handle small as well as large splitting jobs easily. The all steel body makes it perfect for rough and tough use. Being electric, you don’t have to deal with fumes and most importantly, compared to other log splitters in the market, this one is much quitter, so it gets the job done peacefully. The drawback of this splitter is that though it has wheels for transportation, they are plastic, which makes it difficult to roll, especially as this is heavier than the other log splitter in its range. Secondly, though it has a favorable capacity, if you try a log thicker than 15 inches, the machine will choke and stutter. 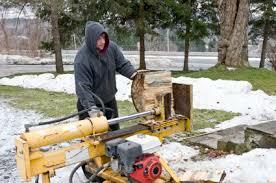 Each of the log splitters mentioned does the job and do it well. What you pick for your usage will depend upon your requirement and importantly your budget. If you are looking for a pocket-friendly log splitter, the best choice is the WEN 56206 6-Ton Electric Log Splitter. Each of these splitters is efficient when it comes to splitting logs of medium thickness. The Pow’R’Kraft log splitter is the quietest and the most energy efficient, thanks to its 2 sp2-speedration, while the Boss Industrial 7-ton log splitter offers high speed, better efficiency log splitting. Being electric, all three are fume free (unlike gas log splitters) and hence, all three can be used outdoors as well as indoors.